Description:Look no further! Absolutely everything you need to start playing the guitar is included with this guitar package from here. A full scale solid wood electric guitar, a gig bag case and all the accessories you need to get on your way! Tuners work smooth and proper and have been cleaned and lubed with a guitar specific lubricant. It will also be a great gift for new, aspiring musicians or guitar enthusiasts. SOLID WOOD GUITAR - Constructed with a hardwood body, rosewood fingerboard, and Maplewood with truss rod neck, it features solidity but no harmful odor so that you can play it freely. This heavy, durable guitar will stand up to years of wear and tear. The lightweight maple neck and smooth yet supportive rosewood fret board produces resonant sound for players of all skill levels. 21 FRETS & SWITCHES - Classic electric guitar design with 21 frets allows for mellow playing and comfortable neck pickup placement. Two knobs for volume control, one for tone control, while one is 3-way switch. SINGLE COIL PICKUP - Delivers a smooth tone , it is ideal for rock and roll, playing the blues, and everything else in between! The natural, bright sound complements the warm sounds of the solid wood. GUITAR TRAVEL BAG - Take your electric guitar to your lesson or where ever the next adventure with a suitable bag . You can either lift or carry the guitar with straps. Ideal for prolonging your guitar's quality and easy storage. 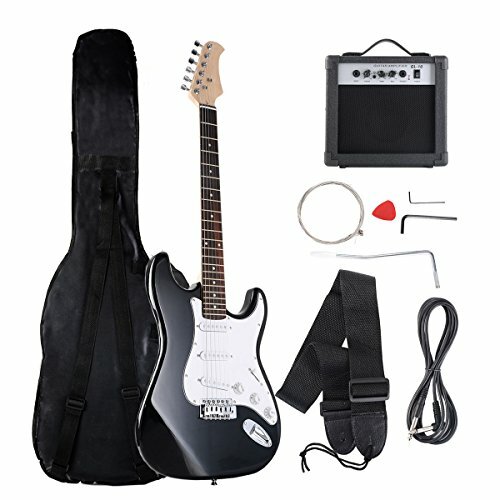 Great Gift & WORRY FREE PURCHASE - Costzon 39" Electric Guitar with 10W amp pack is a great gift for new, aspiring musicians or guitar enthusiasts. We at Costzon stand behind our products with our Satisfaction Guarantee. We not only offer qualified products with favorable price to our customers, but also great customer service.